Shawn Towle once enjoyed the same access as other reporters covering Minnesota's Senate. Then Republicans called him out after discovering he was a paid consultant to Senate Democrats. "I'm effectively a one-man operation," Towle said of supporting his left-leaning website Checks & Balances with partisan consulting work. "To be able to survive in an online world you have to do more than just one thing." Lawmakers didn't see it that way. This year, the Senate changed its media rules so people paid by political parties couldn't get access to the chamber. It left Towle without press credentials — and rekindled the debate about who is a journalist and whether it matters who's paying journalism's bills. In a media environment where Fox News, MSNBC and other prominent national news organizations have reputations for bias, there's nothing exceptional about having a point of view. 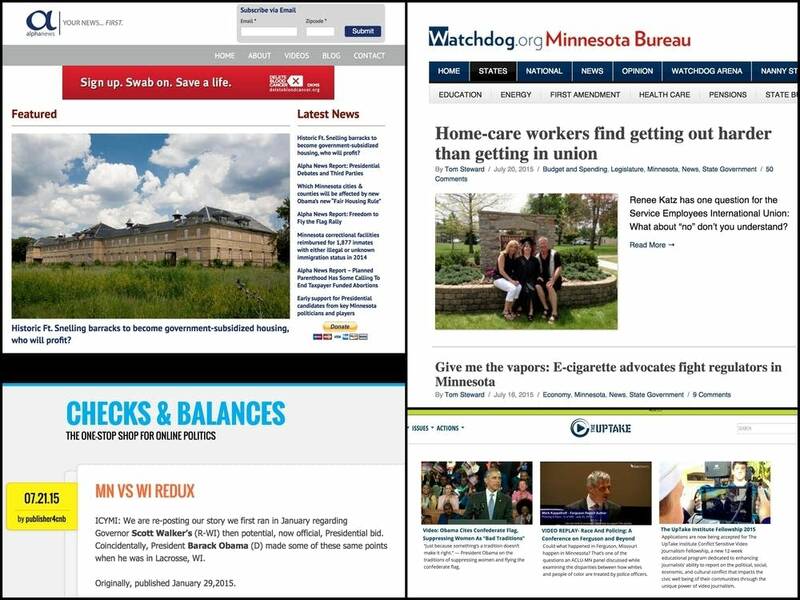 But as traditional sources of revenue for news dry up, some Minnesota news operations are developing stronger ties to partisan donors and political operatives. In some cases, tax rules allow these news outlets to shield their donors. Traditionally, news outlets have been private companies, such as the Minneapolis Star Tribune, the St. Paul Pioneer Press and WCCO. Others, including MinnPost and MPR News, are nonprofits. MPR posts major donors and board members on its website (.pdf). MinnPost does the same on its site. But generally, tax laws don't require nonprofits to make their donors public. Increasingly, tax-exempt groups fund media sites that trumpet and reinforce the views of a particular candidate or wing of a party as a key part of a sophisticated campaign operation, said former IRS official Marc Owens. "It all operates as an organized, focused effort to identify voters who will vote and find the messages that will get them out of bed on a cold November morning," said Owens, who is now a partner with Loeb & Loeb in Washington. For one Minnesota-based group, the money trail intersects with a handful of conservative donors, including Charles Koch, a wealthy libertarian businessman who, along with his brother David, is reshaping the way politics and elections operate. Seeing a dwindling supply of local reporting, in 2009 the Franklin Center for Government and Public Integrity launched Watchdog.org, a network of state-based media sites that provide "non-partisan journalism" meant to "hold politicians and bureaucrats at all levels accountable for their handling of taxpayers' dollars and to promote individual liberty and free markets." Steward has political ties. He worked for both former Minnesota Republican Sen. Norm Coleman and former Republican presidential candidate John McCain. The Franklin Center, which funds the Minnesota Watchdog bureau, has political ties, too. Tax documents show that the group has received nearly $22 million between 2011 and 2013 from the Donors Trust, a philanthropic organization that donates exclusively to groups "devoted to supporting organizations that promote liberty," and the affiliated Donors Capital Fund. The Donors Trust and the Donors Capital Fund are supported by an array of conservative groups, including the Knowledge and Progress Fund, a nonprofit founded by Charles Koch. Since 2005, Koch's foundation has contributed more than $13 million to the Donors Trust and Donors Capital Fund. In 2013, roughly 75 percent of the Franklin Center's $8 million in revenue came from the Donors Trust network, according to an MPR News analysis of public records. But Watchdog.org Editor Will Swaim said the money has no bearing on the group's reporting. Swaim, who built his career working for alternative weekly newspapers, said the money comes in because libertarian donors like what Watchdog.org does. And Swaim said he's skeptical of journalists who don't embrace their biases. "I don't believe reporters are objective, because they are human," he said. "A dangerous reporter is one who doesn't understand their own biases." Amy Mitchell, director of journalism research at the Pew Research Center, said state news networks funded by a single donor, like the Franklin Center, tend to be less transparent about their funding sources. That may confuse consumers about who is behind the news, Mitchell said. "Transparency enables the consumer to make a judgment for themselves about what they want to do with that information — to embrace it, to read it, to know where it's coming from," she said. "The first place to start is by sharing that information." News outlets on the left have ties to party officials and donors, too. And like their conservative counterparts, they say funding doesn't influence their writing. Towle, who's consulted for Democrats and Republicans, said his consulting work informed his writing but that he never planted stories on his blog at the request of his clients. Seed money was critical to the video streaming service The UpTake, which broadcasts political events and meetings at the Minnesota Capitol. The initial grant came from the Alliance for a Better Minnesota to cover the 2008 Republican National Convention in St. Paul. The Alliance for a Better Minnesota is a liberal group that uses money raised from well-heeled liberal donors and unions to help elect Democrats, including Gov. Mark Dayton in 2010 and 2014. The UpTake says it no longer gets Alliance money. The UpTake lists its major donors on its website. Among them is Voqal Fund, which donates to progressive groups, including the Alliance for a Better Minnesota and TakeAction Minnesota, a group that was instrumental in defeating the voter ID amendment in 2012. Most recently, Voqal Fund gave The UpTake $30,000 to cover the Legislature. The UpTake's Executive Director Jeff Achen doesn't deny the organization's left-leaning reputation and said the group seeks money from foundations that share its priorities. "The progressive funds say, 'We want to fund coverage of immigrant rights and labor equality,' and a lot of liberal issues," Achen said. "We're saying, 'Those are the things we are passionate about covering as a news organization.' That's why we've earned a reputation for being a more liberal news source." Schliesing did speak earlier this month with conservative talk radio host John Gilmore about the project. "I like to think that at Alpha News, we cover the things that people aren't covering," Schliesing said. Schliesing, a 2014 graduate of the University of Minnesota, said she worked for two conservative groups — the Leadership Institute and Turning Point USA, a student group that promotes free-market principles — before "auditioning" for Alpha News. She also said that Alpha News applied for but did not get credentials at the State Capitol. Capitol officials said Alpha News hasn't been around long enough to determine whether it qualifies for access. Alpha News stands out for a number of reasons; some stories carry no bylines, are scarce on quotes, often aggregate facts and information from other news outlets, and tout non-scientific Facebook polls. The Society for Professional Journalists sets out standards for identifying sources and attribution in its code of ethics. Schliesing defended Alpha News' approach. "I don't think it's fair to say it's cowardly that we don't use bylines, especially when the intent is not to hide," Schliesing said. "The intent is to focus on the content."